One of my favorite blogs is Steve Hyde’s Jungle Adventures. Steve is the Founder and Director of Asia for Jesus, a multi-faceted ministry that is strategically poised to help change the spiritual landscape of Cambodia and neighboring countries. When I met Steve in Cambodia in 2009, it didn’t take long for me to become inspired by the scope of his work. Steve has a huge vision for the unreached peoples of Asia and is uniquely gifted in orchestrating the strategic components that are propelling his vision into reality. Steve and his capable staff of national workers train thousands of church leaders and start hundreds of new churches every year. Steve’s ministry translates and publishes more books annually than all other Cambodian publishers combined. Asia for Jesus also produces Christian radio broadcasts. And, as if that were not enough, Steve also has a team dedicated to translating the Bible into Khmer by using the latest and most sophisticated translation software available. When I received Steve’s latest blog in my email this morning I was thrilled to read the title: Khmer Christian Bible: Hot off the Press! Steve wrote, “After 8 years of translation, editing layouts, creating beautiful fonts, testing, proofreading, and evaluating huge amounts of feedback we have finally launched the New Testament of the Khmer Christian Bible!” This is fantastic news for the people of Cambodia. 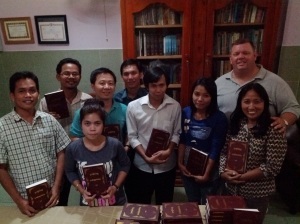 Steve noted in his blog that “only 26% of Cambodian Christians own a Bible and then added that they “hope to change that soon with the launching of this new Bible.” Steve and his team hope to print about 20,000 New Testaments per month. The New Testaments will be available at a cost of $3.00 each but the impact that they will have will be priceless. Please pray for Steve and his team as they print and distribute copies of the New Testament and continue their work of translating the Old Testament. Steve and his wife Noit with some of the members of the Khmer New Testament translation team. Praise be to God! Now they will read the very words of God in their language… how AMAZING and WONDERFUL!!! This is very cool, indeed. What a huge impact this will make for the kingdom for years to come.